It’s week 2 of National Home Security Month! This week, we’re discussing how to secure the entry points to your home. Making sure that the entry points are properly protected is an essential foundation for any secure property. Unfortunately, savvy criminals have a number of techniques up their sleeve for getting into your home uninvited, including lock snapping, ‘fishing’, tracking victims and much more. Gladly though, there are a few things that you can do to help beat the burglar this winter. Ranging from simplistic and cheap to professional, higher impact solutions, we’ve got plenty of tips and advice to help you secure your home. As obvious as this may sound, your first port of call is to make sure that you always lock your door when you go out, no matter how quick you’ll be. Remember, 36% of all burglaries are crimes of opportunity, with burglars letting themselves in through unlocked doors or windows. And, with 59% of burglaries occurring when the victim is at home, it’s a good idea to lock them when you’re in the house too! The next thing to check is the quality of your doors & locks. If your door is hollow, it would definitely be a good idea to replace it with a solid door, which will give added resilience against forced entry. Extra security can be added if door is more than 44mm thick, as this will allow for a mortice lock to be installed. Mortice locks are a good security feature because the mechanism of the lock is actually embedded into the door and frame, as opposed to a cylinder lock which is not flush to the surface, making it vulnerable to lock snapping. If replacing your door is not viable though, replacing the lock is likely to be your next best option. If you must opt for a cylinder lock, make sure that meets standard, TS007. 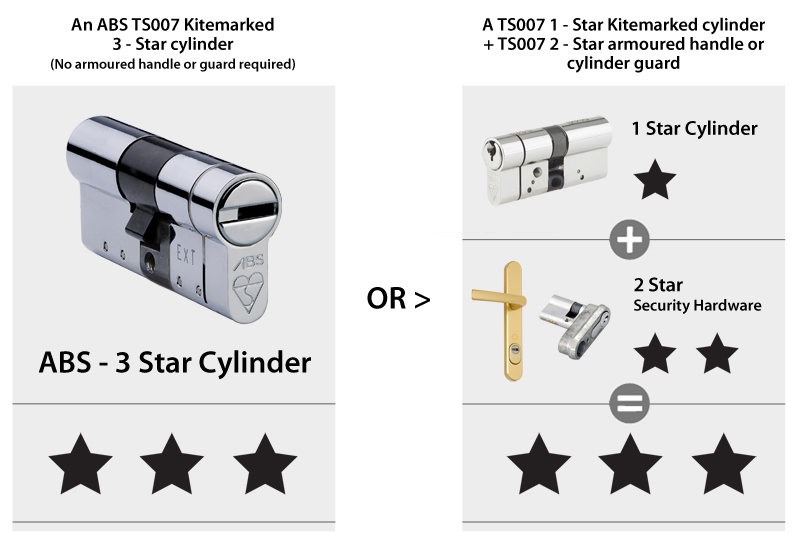 Look for a 3 star solution, so either a TS007 Kitemarked 3 star cylinder, or a TS007 Kitemarked 1 star cylinder combined with TS007 Kitemarked 2 star armored handle/lock surround, to help protect from lock snapping. Windows are a vulnerable entry point to your home for obvious reasons. As well as ensuring that they have the best possible lock fitted to them, putting a protective, clear film over windows will make them more difficult to smash, meaning that any potential criminal would have to spend longer breaking into your property. The amount of time needed to break into a home is a big factor for a burglar when deciding who to target, because not only does it increase their chances of being caught, but it shows that you are security conscious and likely to have taken other protective measures. Another great idea to improve window security is to have ‘shock detectors’ fitted to windows as part of your Intruder Alarm system, causing an alarm to go off if if someone is trying to smash or bump the window open. If you’d like more advice to secure your home, or if you require the help of one of our Security Experts, contact our team today! Either call us on 0191 270 0808 or email us at info@tynesidesecurity.co.uk – we look forward to hearing from you!